This is a personal blog. The opinions expressed here represent my own and not those of any of my employers or customers. Except if stated otherwise, all the code shared is reusable under a MIT/X11 licence. If a picture is missing a copyright notice, it's probably because I'm owning it. 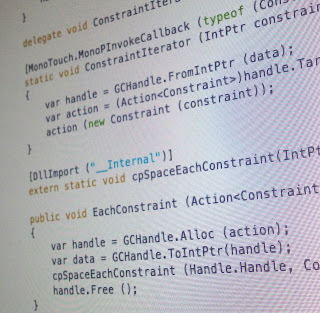 TL;DR: get the source of the game on github. With the release of iOS7, and same day support in Xamarin.iOS, I'm spending all my free time playing with the new APIs. I particularly love iBeacon and Background Fetch. Next on my list was SpriteKit. SpriteKit is a 2D game engine, not unlike cocos2d at all. We'll see next that it's going from one platform to another is very simple. less boilerplate. Or even no boilerplate at all with SpriteKit. a SKView is a UIView, and is ready to serve as soon as you PresentScene() it. Compare that with the directors you have to put in place before writing a line of game logic in cocos2d. It's a win. less leaky abstractions. I haven't compared performances, but SpriteKit doesn't expose stuffs like BatchNodes, so it's one stuff you don't have to bother about. I found myself looking for BitmapFonts. It seems like a standard in game development, but missing from SpriteKit (or I haven't found it). I'm quite confident that's a stuff we'll see in an upcoming new version. As the original game, this port doesn't leverage any Physics engine, so I have nothing to say about SKPhysics* stuffs. From the API, it looks very similar to what Chipmunk offer. So it was a very pleasant port, at the end taking even less lines of code than the original port, and only 2 hours to write. If you want to start developing games, going for SpriteKit on Xamarin.iOS is really a no brainer. No boilerplate, no gotchas, just fun. The code is on github, it's MIT/X11 so do whatever you want with it. The graphics are borrowed from the original game, read the LICENSE about their usage. One of my favorite new feature of iOS 7 is the addition of iBeacons. You'll find plenty of articles explaining how it'll change the way you do shopping (if you still shop offline), allows indoor localization, and even more. Glue a beacon on your kids, and you'll know when they go too far away (digital leash). Attach one to your wallet and your phone will tell you you're leaving the house with no cash. Applications are endless. As of now, the only objects you can use as iBeacons are iOS devices. The protocol should be made available soon, allowing 3rd party components to appear, and at that time they should sell for a few dollars a piece (based on a general purpose BT chip, like the BLE112, a beacon should cost around 40$ to build. Prices will surely drop by using cheaper and specialized chips). That'll be your beacon. uuid and identifier are mandatory. Major and minor are optional. There's a trick here, uuid doesn't have to be unique. All beacons of a common group will probably have the same uuid, and different major/minor versions. As devices BT ids changes from time to time, your device will be sometimes advertised twice. That won't happen with real iBeacons. Read Region Monitoring if you need more details. 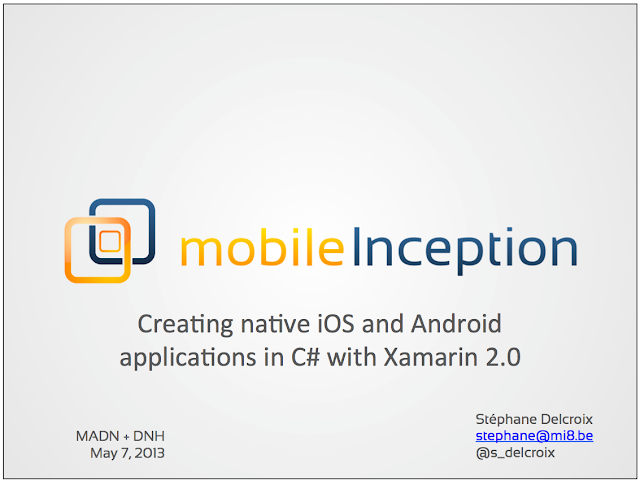 Yesterday evening, May 7, two belgian user groups, MADN and DotNetHub invited me to give a 2 hour introduction session on creating multi-platforms mobile applications in c# with Xamarin 2.0. Microsoft Belgium was hosting the session, and the room was packed ! I really enjoyed that evening, and just wanted to thank you all: attendees for their presence and interactions, MADN and DNH for the invite and the bottle of wine, Microsoft Belgium for the place, food and drinks, and Xamarin for the give away licences, monkeys and t-shirts. Every time you have to ask your user "What's your favourite colour" or "What is the air-speed velocity of an unladen swallow?" from within your iOS application, you have to ask yourself "Wait, will the field still be visible with the virtual keyboard displayed ?" Note: like the previous post, this one is a follow-up on a series written by someone else. We're all building on top of giant's shoulders. 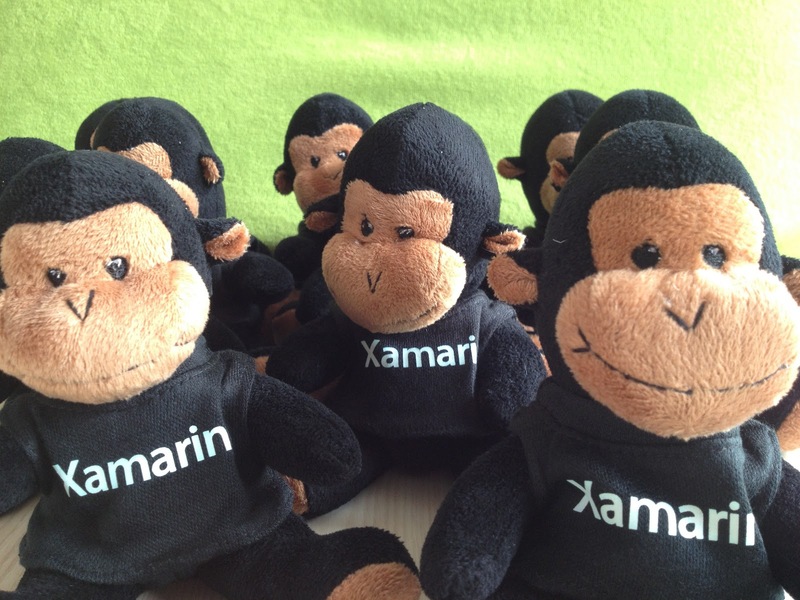 My giant today is Sébastien Pouliot from Xamarin. Read his series Producing Better Bindings. Second Note: if you're reading this from a news aggregator, you might miss the embedded gists. Read the original there. I'm lately enjoying writing bindings for Xamarin.iOS and Xamarin.Mac, a lot for the fun, very little for profit. The biggest project by far was creating a managed bindings for cocos2d (v2). This library is huge (~2500 public methods), and the API is far from being fixed in stone. The library is so big that at some point I just gave up, until Miguel resumed the effort during end-of-year break. Note: this blog post follows the ones of Frank Krueger about the alpha release of mono 3.x for Xamarin.iOS bringing .NET 4.5 features to the mobile world: Drag-n-drop and Scripting Users. Read that first, it's worth it. If you're using the Chipmunk bindings, the correct way to handle collisions between shapes is to register 4 (FOUR!) handlers for the different steps: begin, preSolve, postSolve and separate. 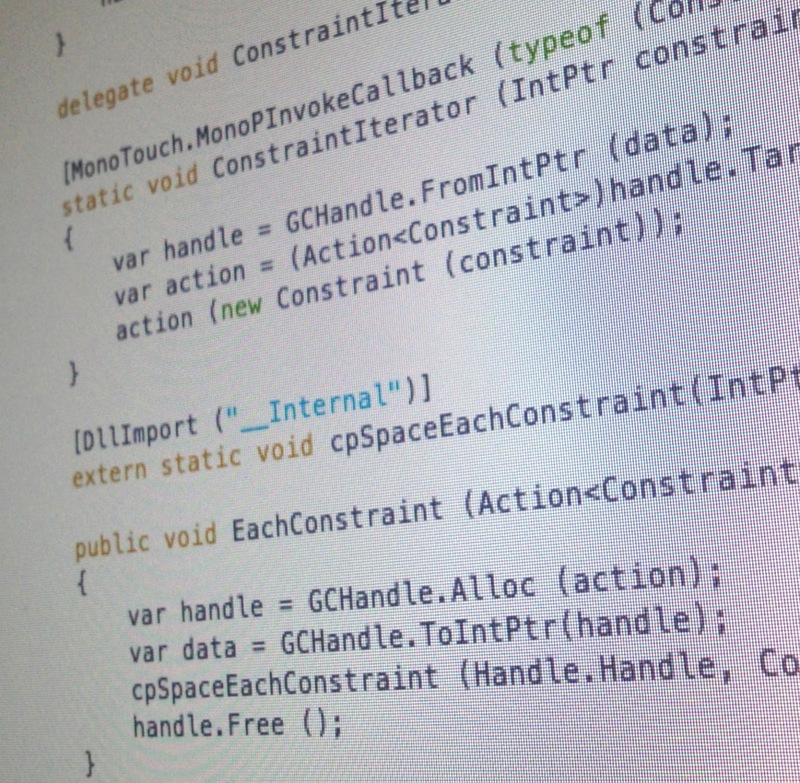 Your collision handling logic is then spread in 4 different functions. All of that for the same collision. There's one annoying technical limitation of Xamarin.iOS if you have to pass a C# delegate instance to unmanaged code. It's not new, and it's well documented. But still, having to flag the callback with an attribute and no instance method makes an API hard to use if you don't care that much about the internals of the library you're consuming. I'm currently polishing the Chipmunk binding for Xamarin.iOS, and the cpSpace has some functions taking callbacks, like cpSpaceEachBody or cpSpaceAddPostStepCallback.